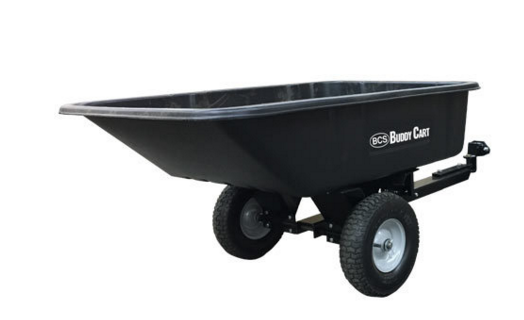 Meet BCS’s most convenient attachment yet: The Buddy Cart—an easy-to-use, self-propelled barrow that hauls up to 450 pounds and 10 cubic feet of volume. 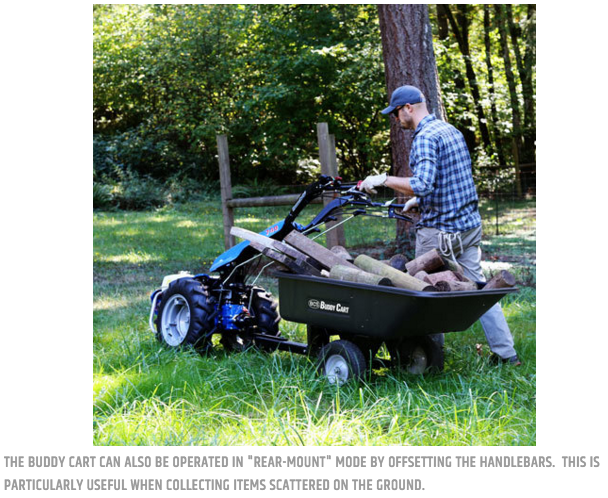 Easily haul compost, rocks, firewood, etc., and effortlessly maneuver through common 36″ gates. The Buddy Cart measures 33.5″ wide, 72″ long (including tongue), and 27″ high. 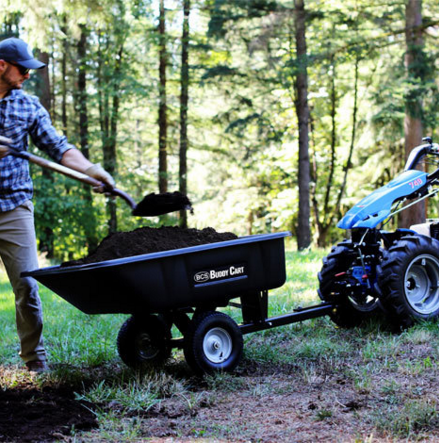 Featuring a heavy-duty steel tongue, the Buddy Cart easily installs to the tractor’s PTO connection point on BCS models 722 and up. The powder paint-coated tongue is spring-loaded, enabling it to “flex” while navigating uneven ground contours. The frame of the Cart has a low center of gravity, making it less prone to tipping when crossing slopes and uneven terrain. 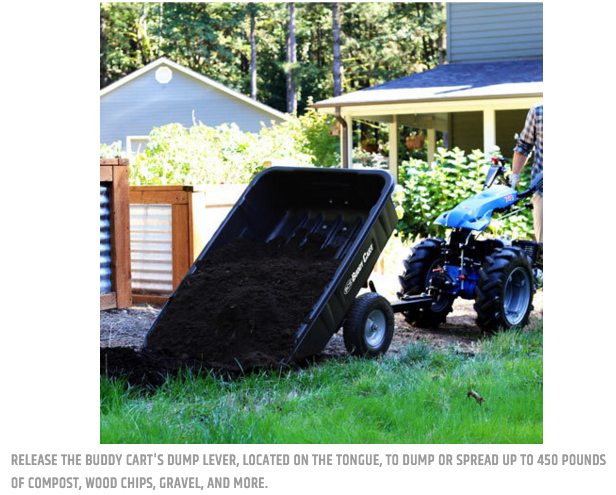 The Buddy Cart’s rustproof poly tub is 10 cubic feet and tilts to dump loads with the activation of the dump lever located on the tongue. The dump lever includes a rope hole so the cart can be remotely dumped from the operator’s position. Finally, the Buddy Cart can also be used in “rear-mount” position by rotating the BCS handlebars and offsetting the handlebars to the left or right. This allows you to conveniently collect yard debris without having to walk around the tractor to reach your cart. Given all these features, the question is: Could you use a “buddy” to help with all the hauling jobs around your property? Attachment only. 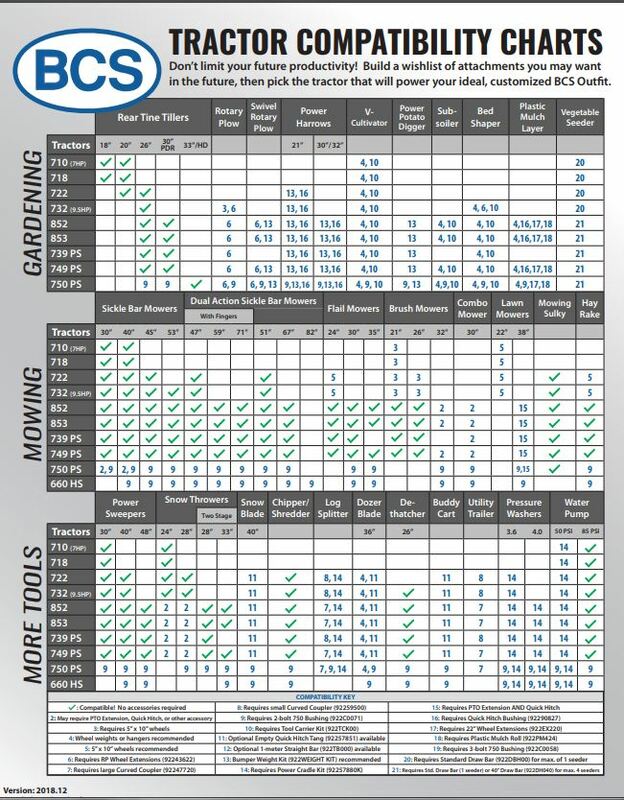 See compatibility chart below for compatible tractor models. 450-pound, 10 cubic foot capacity. Unit weight is 82 pounds. 33.5″ wide, 72″ long, 27″ high. Spring-loaded, heavy-duty 3/16″ steel tongue. Can be operated in front or rear-mount position. Dump loads with the activation of the dump lever located on the tongue. Recommended with models 722 and up.